This book is about to be replaced by a new edition in mid-September 2017, titles Walk! the Costa del Sol (Axarquia). Make sure you are buying the latest edition. 'Axarquia Revitalised'. Selling out of our first edition to the Costa del Sol's premiere mountain landscapes has enabled us to create a completely revitalised second edition. If you are looking for something wild, but close to resort civilisation, then "Walk! the Axarquia" could be for you. The Axarquia contains the Sierras Tejeda and Almijara which form the backbone of the region. Blessed with high summits, dizzying pinnacles, dramatic crags, deep ravines, dozens of springs, delightful rivers and the best coves on the Costa del Sol, this is a region with something for everyone. The only prerequisites for benefiting from all this are a desire to get off the beaten track and a set of relatively sturdy legs. Charles Davis has brought together 32 fully detailed walking routes for his Axarquia 'home region' ranging from moderate routes up to adventures requiring a good degree of fitness. Whichever group you find yourself in you'll find plenty of adventures to tempt you away from the 'Costa del Concrete'! All walking routes include:- - walking route summary. - ratings for Effort, Time, Distance, Ascents/Descents, Refreshments and Vertigo Risk. - fully detailed walk description including frequent timings to aid navigation and check your progress. - gps waypoints at every key point on every route. - full colour Tour & Trail Map section for the route. - short walk and stroll alternatives. New for our second edition are:- - Tour & Trail Map sections replacing the old IGN mapping, giving easy to read clarity along with larger map sections. - Altitude Profiles so you can see at a glance the ascents and descents involved in the walking route. - revised access details guiding you to the start of each walking route, including parking advice and waypoints for any off tarmac driving. - details of additional walking routes in the Axarquia region. - more pictures helping you identify starting points for routes. With all the extra detail, larger mapping, pictures et al our second edition has expanded to 176 full colour pages to give you the best, and best value, walking guide book to this exciting region. Full gps waypoint files for Walk! 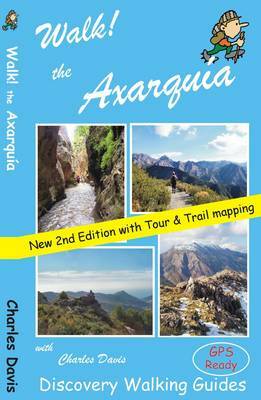 the Axarquia are included on the Personal Navigator Files CD published by Discovery Walking Guides.